I’m In The School Band – Should I Take Private Lessons? Band teachers appreciate having students who take private lessons in the band. Students who are privately taught tend to advance faster and with greater comprehension than those who are not. Having these students in the band improves the overall quality of the band performance. The increased proficiency of the students who take private lessons can also benefit those students who do not take private lessons. 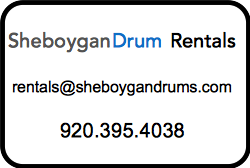 This entry was posted in Drum Lessons and tagged drum lessons, drum teacher, drums, private drum lessons, school band on October 18, 2012 by Sheboygan Drums.